I haven’t posted anything for a long time. Doesn’t mean I’m ignoring my blog cuz I use it to lookup my recipes frequently. Work and family seem to have left less time to write. But with Thanksgiving coming, I decided to put down the stuffing recipe I got from my daughter and edited to what we had on hand. 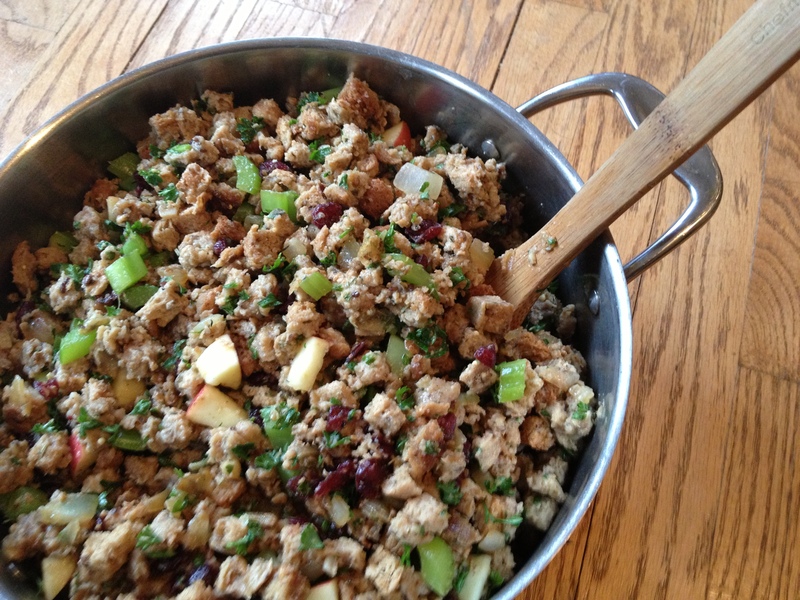 This stuffing goes over very well with our guests and it’s open to any tweaking or changes the cook wants to make! 1 1/2 loaves of 100% whole wheat or multi-grain bread. 1/2 cup chopped fresh parsley. Substitute dried if not available. 4-5 cups liquid – mixture of chicken/turkey broth and water – use proportions as you wish. Cube the bread in desired size. (My hubby did an awesome job of making nice small cubes of the bread and it made a difference in the outcome). Put the bread in a couple of cake pans and toast in oven at 350 for 10-15 minutes. Check on this frequently and stir as needed as the bread isn’t in a single layer. Remove when it’s at your desired “toastiness” 🙂 and transfer to a large bowl. Brown the sausage in skillet. When almost done, add the onions and garlic. Stir until onions done and sausage is nicely browned… probably another 5 minutes. Add the celery, rosemary, thyme, and sage. Stir a few more minutes to meld flavors. Pour sausage mixture over dried bread cubes. Add apple, cranberries, melted butter and parsley. Mix. Add broth, stirring until desired consistency is reached. The last time I made this, I used 4 1/2 cups broth. The dryness of the bread and how moist you want it if you stuff the turkey will dictate the amount of liquid used. You may either stuff the turkey or bake the stuffing in the oven. I have baked it at 350 for 45 minutes or so. I also like to put it in a crockpot on low for a couple hours.